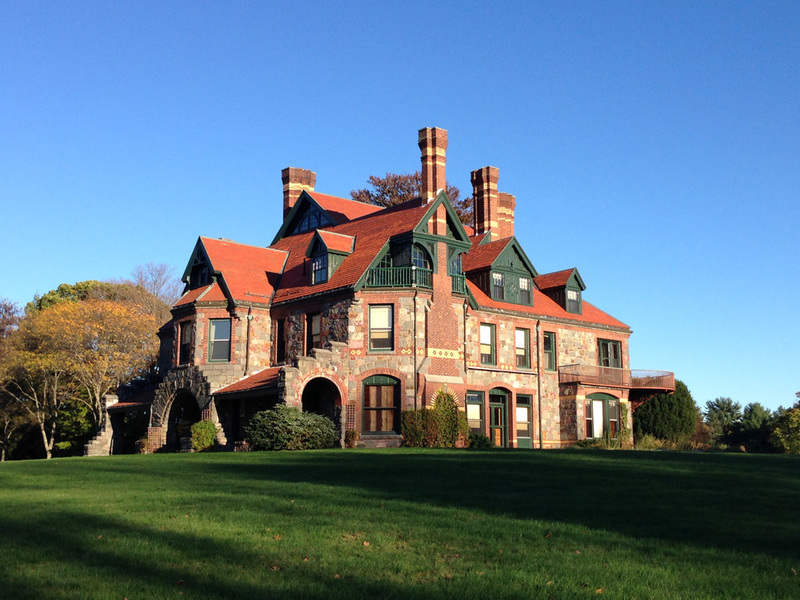 Historic New England is working to transform the 1878 Eustis Estate in Milton, Massachusetts, into a museum and study center opening in 2017. Below, Curatorial and Interpretive Planning Assistant Elyse Werling reveals the story behind a surprising find the attic. As part of the effort to turn the Eustis Estate from a private home into a public museum space, we are replacing the majority of the electrical wiring. Electricians are working throughout the house, from the basement to the attic eaves. 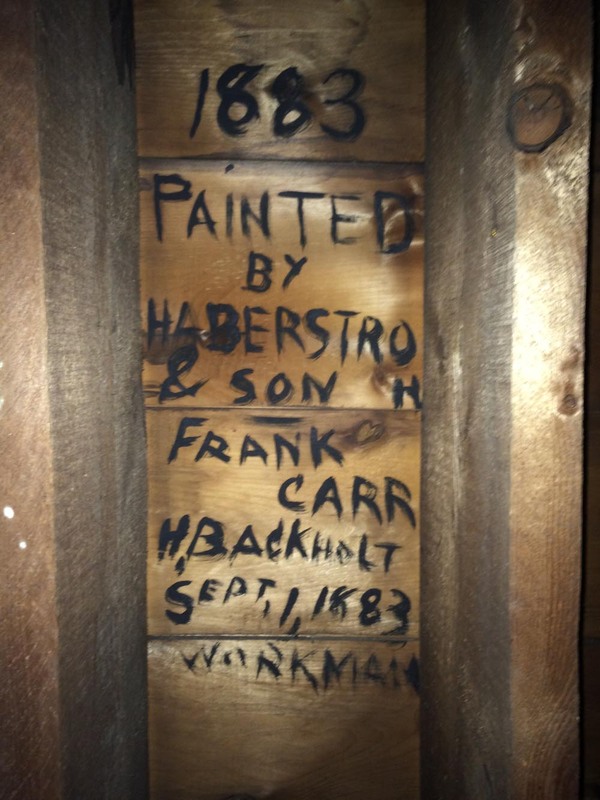 In the highest point of the attic, one of them discovered what is among the most exciting finds yet at the Eustis Estate: an 1883 painter’s mark. This seemingly small find has opened up new doors in Historic New England’s research and interpretation of the estate. Lucas Haberstroh (1822-1883), who came to Boston by way of Germany and England, founded the firm L. Haberstroh & Son in 1848. His son Albert (1855-1912) joined him in 1877. The firm operated on School Street in Boston until Lucas’s death in 1883; Albert then moved the business to 9 Park Street, where it remained for more than twenty years. In 1905 Albert bought a building at 647 Boylston Street, where the firm operated until his death in 1912. To this day the façade bears the firm’s name and decorative ornamentation. Albert Haberstroh explained this specialization further in his 1889 book, Art in Decoration. He describes a patented system called the “Haberstroh Process,” a decorative technique that allows a designer to stencil onto walls and other surfaces in both high and low relief. Historic New England speculates that this technique was used on the walls in the small parlor of the Eustis Estate, and we hope to verify this through continued research. Throughout the years Habestroh & Son decorated numerous private residences and commercial buildings. They assisted in the interior decoration of the Colonial Theatre (1900) and the Cutler Majestic Theatre (1903) in Boston. While we don’t yet know exactly what work the Haberstroh firm completed at the Eustis Estate, we can be certain that they did work there. Interestingly, the 1883 date on the painter’s mark matches exactly what we believe to be the end date of the house’s construction. Stay informed about finds at the Eustis Estate by signing up to receive email updates. American Architect and Building News. March 7, 1903. No. 250, Vol. LXXIX. Boston: American Architect Company, 1903. American Architect and Building News. June 1, 1901. No. 1372, Vol. LXXII. Boston: American Architect Company, 1901. Wall, William E. The Oldest Paint Shops in Massachusetts. Somerville: William E. Wall, 1910. Haberstroh, Albert. Art in Decoration. 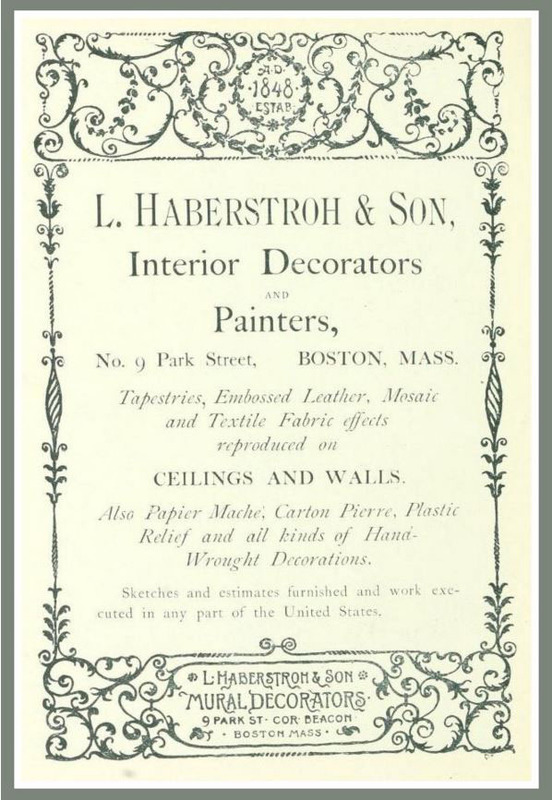 Boston: L. Haberstroh and Son, 1889.